Changeable. That was the word for the weather on Memorial Day weekend. Every time I looked at the forecast it had changed. Early in the week leading up the forecast had shown Saturday as being a good day, and then it was Sunday, or maybe Monday. The forecast continued to change. By Friday morning none of the days looked ideal, but Saturday seemed to the be best, although it would be cloudy. Plans have a way of changing and I was unable to hike either Saturday or Sunday. I checked the forecast on Sunday afternoon and the prediction was rain and possible thunderstorms early on Monday, but ending by 8 or 9 am. After the rain ended it was supposed to gradually clear and by afternoon be mostly sunny. I started out later than I normally would to allow the rain pass. The drive to the trailhead was 1h45m. As I drove west on the highway I passed through several pockets of rain. About 30 min from my destination it got very dark and the clouds opened up and it poured. I had my windshield wipers on high and it was still difficult to see. Thankfully it passed after about 15 minutes. At the Hornell exit I left the highway and headed a short distance to the Econo Lodge on Filter Plant Rd. I pulled around to the back of one of the buildings and parked. After changing into my new pair of boots I decided to stop into the office and make sure they did not have a problem with me parking there. I told desk clerk that I was parked out of the way, I wasn’t blocking any roadways, and I wasn’t taking any of their parking spots. He told me that it would be fine as long as I returned by evening. I thanked him and headed back to my car to get my pack. 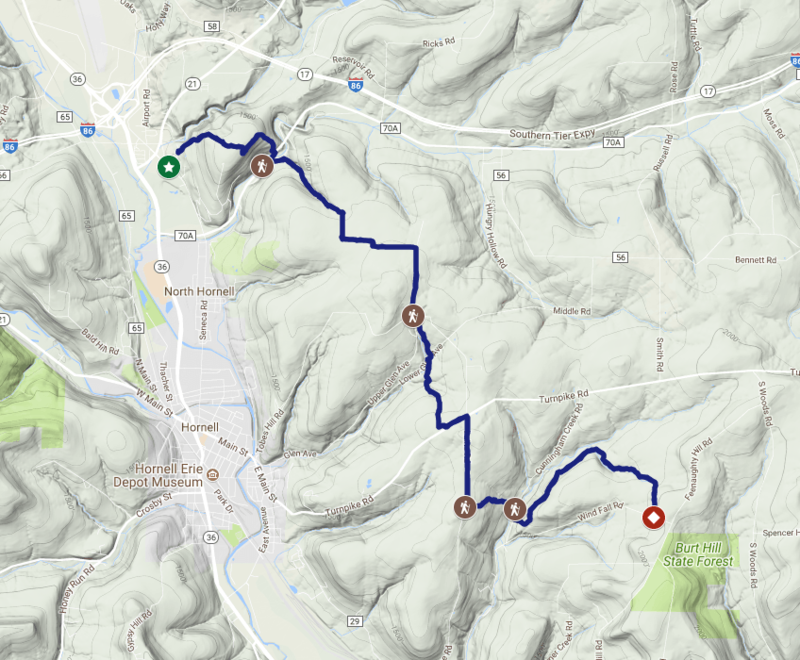 I pulled on my pack I started up the paved road to the Hornell Water Filtration plant (mile 0.0 – 9:33 am). The road turned into the plant parking lot and a rough dirt road continued on up the hill. I climbed up the dirt road road and past a small parking area where a blue car sat. The climb was steep and the air was damp and humid from the recent rain. 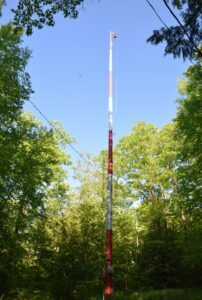 After climbing 400 feet over about 0.5 miles I came to a tall red and white pole with a large red light at the top – a beacon to warn planes of the top of the hill. Just beyond the clearing around the beacon sat a small arbor that the trail passed through. It was unexpected and I stopped to take a few pictures. After passing through the arbor the trail leveled as it crossed the top of the hill before beginning a steep decent down the other side of the hill. The trail headed quickly down to Route 70A. As I braced my legs down the steep descent I thought about how painful this climb would be on the way back; it would be near the end of my hike, around mile 18, and I would be tired and sore by that point. I was not looking forward to it. I stepped out onto the shoulder of Route 70A under gray clouds (mile 1.3 – 10:05 am). A few cars whizzed past me while I snapped a few pictures of the FLT sign at the edge of the road. A short distance down the road I came to a narrow bridge. There was no shoulder on the bridge so I was forced to walk in the road; something I was a little nervous about considering the speed of the cars on this road. Fortunately I made it across the bridge before another car passed. 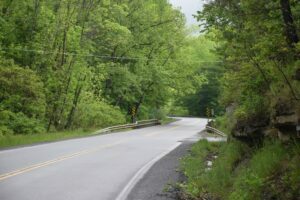 I turned off Route 70A on to Beltz Road, a dead-end dirt road that climbed doubling back in the direction I had just walked. The road quickly came to a corner and shortly after the trail veered off the road and then continued along an old path. At one place water running down from above had crossed over the path and had dug a deep trench. A bridge had been constructed to help hikers over the gully. I continued to climb up the old path. I waded through some areas of tall grass that were still wet from the earlier rain. My hiking pants helped to repel water, but soon the bottoms became wet. Then the trees opened and I saw an old barn in ruins ahead of me (mile 2.2 – 10:28 am). The trail curved its way around the barn to avoid the broken wood and metal that were the remnants of the old structure. Two empty windows in a partially standing wall stared out at me as I passed. Not long after leaving the old barn behind I saw an old metal garbage can ahead of me. It had not rusted, so appeared to be relatively new, but it was battered and banged. As I approached I was surprised, the can was nearly full of bottles and cans. 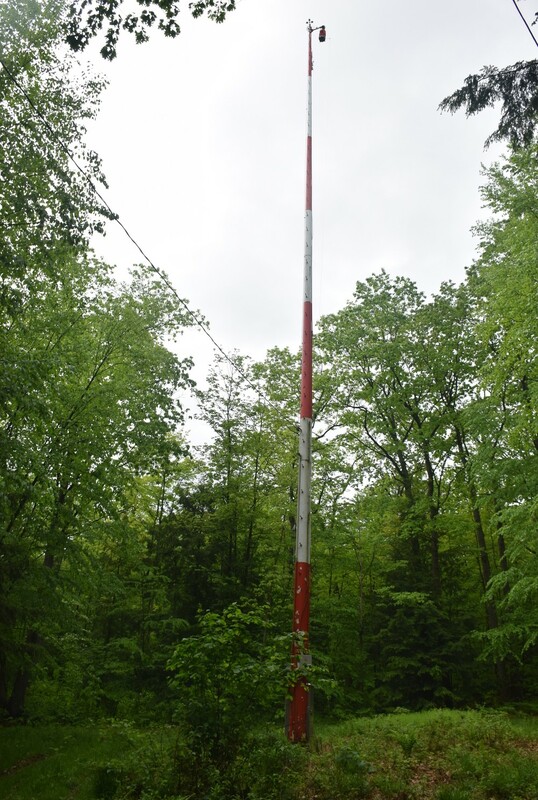 What on earth was it doing out here in the middle of the woods? I looked around for signs of a camp or house, but found nothing. After leaving the mysterious garbage can behind I checked my GPS unit to gauge my progress. I was not happy to see that the battery indicator was down to 1/2; it had shown as full when I started – it was draining too fast. Fortunately I had packed spare batteries and I decided to stop and change them out. I placed the new ones in the unit and tried to power it on, but it immediately shut down. Ugh! I must have grabbed dead batteries. I replaced the original batteries in the unit and hoped that they would hold out for the rest of the hike. A dirt farm road appeared through the trees ahead of me (mile 2.5 – 10:41 am). White trail blazes pointed me to the right and up along a field. Piles of field rocks had been dumped along the road to help fill in some ruts. I continued on up along the field stepping around puddles and mud. Even though I avoided the wettest sections mud began to cake on the heels of my boots and I had to scrape my feet against the ground several times to peel it off. The road turned to the left and continued along between two fields. Vast views of hills and valleys opened up to my left and I stopped to take a few pictures. It was still cloudy and gray and I hoped that on my way back the sky might be clear for better pictures. After a long walk between the fields the road turned once again, this time to the right and then back to the left as it passed by a large garage. The road became more substantial at this point, although it was still dirt and gravel. And it also gained a name, Dewey Road. Ahead of my on my left I saw a large carriage house sitting next to an equally large house. The carriage house was probably as large as my house. I continued on leaving the house behind and passed once again between two fields. After another long walk the road turned to the right and became Upper Glen Avenue. It climbed gently up to a tree line. I passed into the trees and a house sat to my left looking out across the fields to the valleys and hills beyond. I continued on down the road and passed another house. The road left the trees and turned from dirt to rough and patched pavement as it descended past more houses. As I walked down the road I began to see a few breaks of blue in the clouds. I arrived at the four-way intersection of Upper Glen Avenue, Tobes Hill Road and Laine Road. The white trail blazes directed me left onto Laine Road. Just a few yards down the road the trail turned into the woods. As turned to leave the road the sun started to shine through the breaks in the clouds. 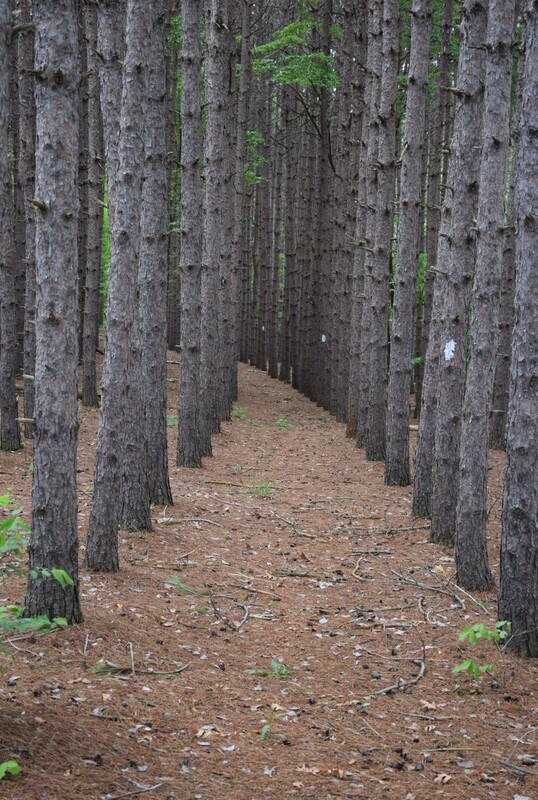 I could see a row of red pines beyond the thick growth at the edge of the road. Just beyond the growth I discovered a very new wooden bench placed under a pair of pines (mile 4.2 – 11:18 am). It was a perfect place to stop and rest. I dropped by pack next to the bench and got out some water and a granola bar and sat down. The sun was beginning to shine brighter as the clouds pulled away and it dotted the ground around me. After a short rest I continued on down through the row of pines and came out on Lower Glen Avenue. I turned down the dirt road under bright sunshine for a few yards and then turned off the road and back into the woods. The trail wound its way through the woods. Ahead of me I spotted a trail register. The register had been decorated and painted with dark blue paint which was now peeling off in places. I stopped to sign my name in the register before moving on. A field opened to my right, but the trail continued to follow along under the trees at the edge of the field. After passing that field another field opened up and the trail turned out into this one. I continued to follow the edge of the field up over a rise. At the top of the rise another great view opened up around me (mile 5.4 – 12:06 pm). A strong breeze was blowing and snapping an American flag on a pole next to a house ahead of me. The sun was shining and large white clouds dotted a bright blue sky. I stopped to take several pictures before continuing on. The house with the flag sat across a road ahead of me, but before reaching the road the trail turned back into the woods I had been walking along. A short distance later it turned and opened out onto Turnpike Road, a well paved road with a yellow line down the middle. I turned left and headed up a small rise along the road. After cresting the rise the road descended for a distance before coming to the intersection of Laine Road (mile 5.8 – 12:18 pm); the same road off which I had found the bench earlier. I turned on to Laine Road and began a climb up another small rise. The pavement ended quickly and turned to dirt. Both sides of the road had been recently cleared and bulldozed. I could still see the tread marks from the bulldozer. Once I reached the top of the rise a large view opened out ahead of me. I could see the road stretching off into the distance, curving to the right. Hills and valleys and fields under blue sky and puffy white clouds spread out before me. I continued down the road descending from the top of the rise passing along and between fields. The clouds continued to fly away and the sun was shinning down brightly. The breeze felt nice and helped keep me cool under the bright sun. After a long road walk I came to the trailhead and left the road behind (mile 6.6 – 12:38 pm). I stopped for a bottle of water and a short rest before moving on. The trail continued along in the woods just beside a field. 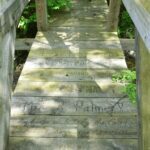 I came to a small bridge with writing carved in the boards. 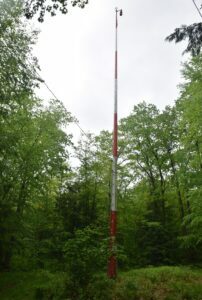 It had been built by the GST BOCES Summer Camp in 2011. 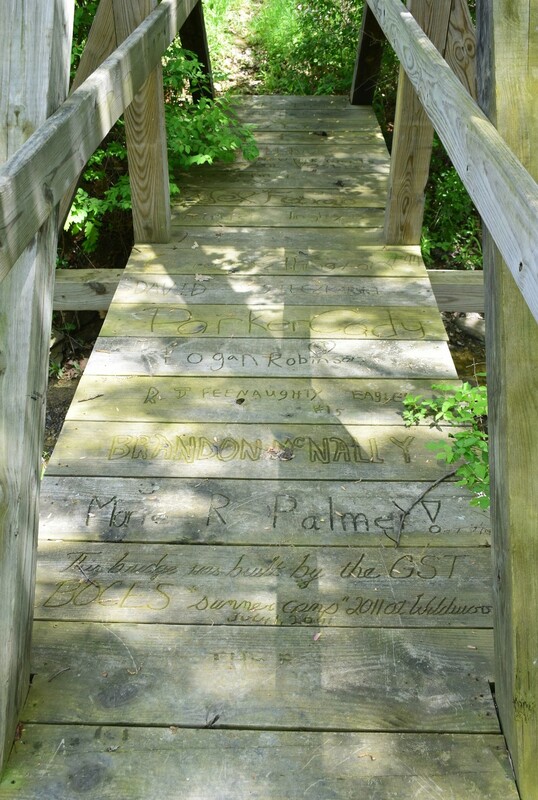 The students who had built the bridge had all carved their names in the boards. The trail left the field behind and began to descend down a hill. At a few places the trail made a switchback to ease the descent. 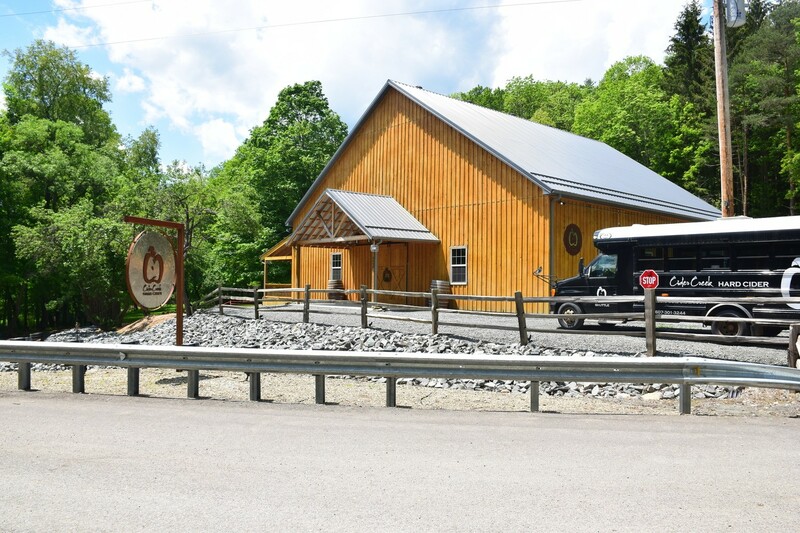 I arrived at Cunningham Creek Road next to what appeared to be a new building. A school bus painted black with white script lettering “Cider Creek” sat next to the building. A sign next to the building proclaimed that this was Cider Creek Hard Cider (mile 7.2 – 12:56 am). Sadly it wasn’t apple season and the building did not look open; a nice hard cider would have really hit the spot. I walked down the road past the hard cider shop and across a bridge over a small stream. The stream ran in front of the hard cider shop and they had set up an area for their customers to sit and enjoy. I thought to myself that I should come back and visit when they were open. I continued on down the road and came to the next turn. The trail headed up a rough dirt path that looked suitable only for four-wheel drive vehicles. I continued on up the path and then turned left off along a now unused and overgrown path. I crossed over a small stream and continued along climbing slowly. The trail meandered through the woods slowly turning to the left before straightening. It was getting late, nearly 2 pm, and I was getting hungry, but I wanted to reach my turn-around point before stopping. I started looking for places to stop. I also checked my GPS and found that it was now warning me that the batteries were low and that it would shut down soon. The battery indicator showed no bars left; there was no way it would last the rest of the trek back. I considered my options; I could just take the half I had and use it to calculate the return route, or maybe I could use my phone. There were two tracking apps that I had installed on my phone. One of the app was Avenza Maps. I had been using it during the hike to check against the Finger Lakes Trails PDF map to make sure I was going the right way. It had tracking capabilities, but I did not know what the battery drain would be like. I also had not used it much beyond a few short distances as an experiment. The other app was Sports Track Live which I used for my runs and bike rides. I was much more familiar with this app. I decided to go with the known. Finally I reached Windfall Hill Road, my turn-around spot (mile 9.5 – 1:59 pm). When I had turned around here back at the beginning of April there had been patches of snow at the edges of some of the fields and the trees were still bare. Now the snow was gone and the trees had leafed out. The fields were bright green under the blue sky. I took a few pictures and then headed back a short distance to a fallen log and sat down. I shut my GPS unit off and got out my lunch. After finishing my lunch I started my phone app and continued back along the trail. I decided I would not check my phone until I got to the next road crossing, about 2.5 miles. That would allow me to see what kind of battery drain the app would have. My phone was at 58%, so as long as the drain was less than 8 – 10% I should be able to continue using it. I moved along quickly. Since I had started later than I usually do I was racing against the clock to make it back to my car before dark; sunset was 8:39 pm. I had about 6 hours until then and it had taken me 4.5 to reach my turn-around. I should have plenty of time, but my return hike was usually slower. Before long I was back at Cunningham Creek Road (mile 11.8 – 3:18 pm). I checked my phone, it had only dropped 4%; that was very good news. It meant I could continue to use the tracking app. 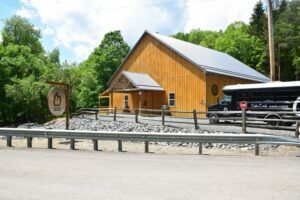 I headed on down the road past the Cider Creek Hard Cider shop and then turned off the road and up the trail. Soon I was passing along the edge of a field next to Laine Road and crossing over the bridge made by the BOCES summer camp. 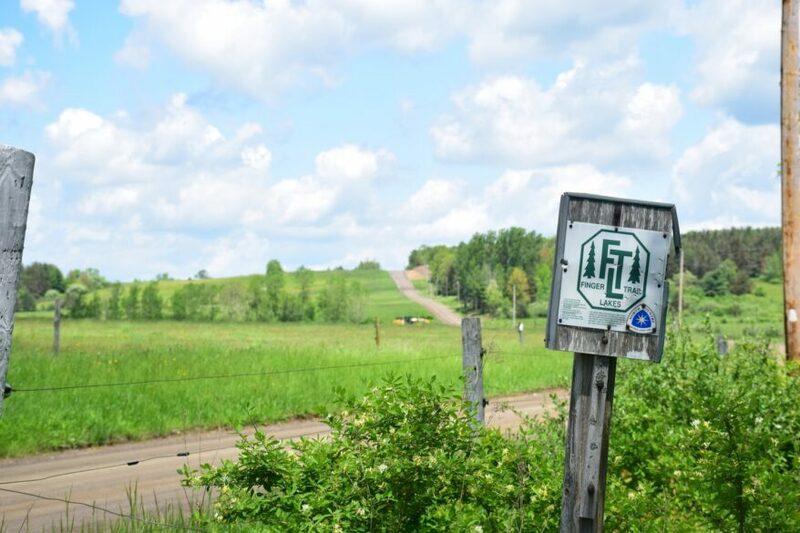 I arrived at the trailhead on Laine Road and decided it would be a good idea to stop (mile 12.5 – 3:36 pm). A long road walk under the bright sun was ahead of me. I set my pack down and got some water and another granola bar. I had a banana, but I was saving that for a break right before the big climb over the hill near the end of the hike. After a short rest I started out onto Laine Road. I followed the road around between the fields with the bright sun shining down on me. The breeze was blowing strongly across the road. I climbed up over the rise and then back down to the intersection of Turnpike Road. I turned left onto the paved road and headed up another rise. Finally I was back at the trailhead and turning off the road (mile 13.6 – 4:04 pm). 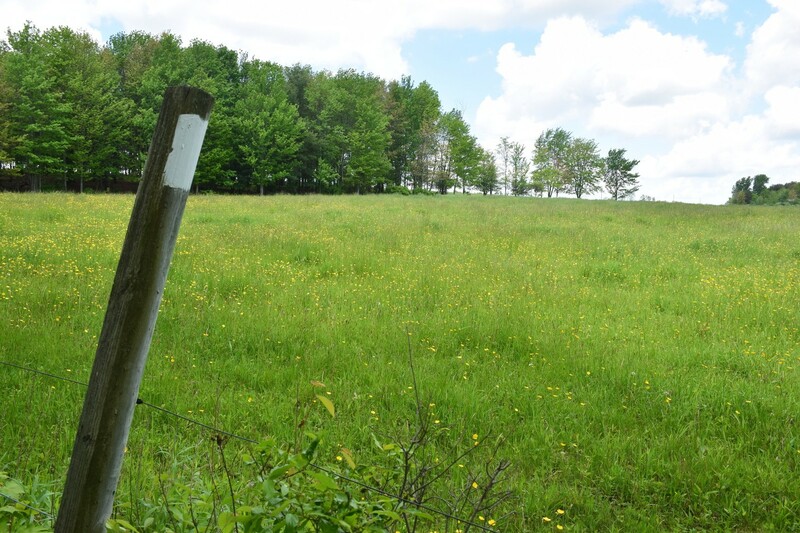 The trail curved around and opened back out into the field where I had stop earlier to take a number of pictures. I stopped once again to take more pictures. I left the field and continued on through the woods as the trail gently wound its way along. The sun dappled the forest floor and the breeze blew through the leaves. If I had more time I would have gotten out my hammock and taken a rest, but I needed to reach my car before dark. 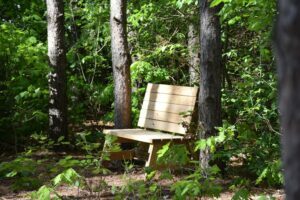 Bench just off Laine Road. I arrived at the trail register once again and signed in for my return trip. After leaving the register I crossed Lower Glen Avenue and began a climb. 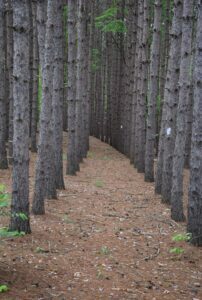 I soon entered the rows of red pine trees I had walked down through earlier. The row of pines curved slightly to the right. As I neared Laine Road I saw the bench ahead of me that I had stopped at earlier. I dropped my pack and took another break (mile 14.9 – 4:48 pm). I had another long road walk through the fields ahead. After getting some water to drink I hoisted my pack again and stepped out on to Laine Road. I turned left and then right up Upper Glen Avenue. I passed by the houses and back into the wooded section before passing the last house at the top of the hill. Another big view opened before me, and this time it was under sun and blue sky. I stopped to take several pictures before continuing on. Upper Glen Avenue turned to the left and became Dewey Road. I passed by the large house with its carriage house and then around past the large garage onto the farm road. I could smell the mud as it dried under the bright sun and strong breeze. In many spots I found my boot prints from earlier in the morning, now dried hard in the dirt. 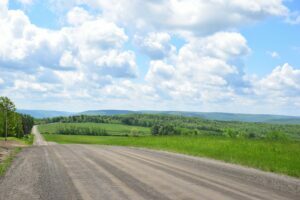 I rounded the corner of the farm road and headed down along a field and past the piles of field rocks that had been dropped at the edge of the road. Ahead of me I saw an old man and woman in a 4-wheel utility vehicle heading my way. I stepped to the side as they passed and said hello. The farm road entered a wooded section between to fields and the trail turned left off into the woods (mile 16.6 – 5:32 pm). 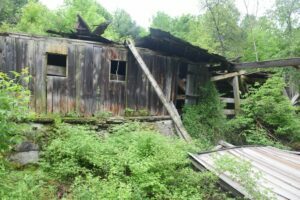 I continued along the trail, passing the odd garbage can and then around the old ruined barn. Soon I was crossing the footbridge over the gully and then back on Beltz Road. 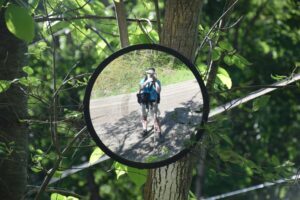 I walked down the road and noticed a mirror had been hung on a tree on the corner; presumably to help see oncoming cars on the narrow road. I stopped to take some “selfies” in the mirror and then headed down to Big Creek Road. I crossed over to the opposite side of the road and headed for the narrow bridge. This time I was not as lucky and two cars passed me while I was on the bridge. I walked as close to the railing as I could, but they still had to move over to the other lane to give me enough room. Finally I was back at the trailhead (mile 17.8 – 6:02 pm). I climbed up the trail a few yards before dropping my pack and taking my last break before tackling the steep climb ahead of me. After eating a banana and drinking a bottle of water I was ready. I pulled on my pack and started up the trail. It climbed steeply for a couple hundred feet before turning and continuing a more gradual climb. The trail turned and leveled; I had made it to the top of the hill. Ahead of me I saw the arbor I had passed through earlier (mile 18.5 – 6:33 pm). And beyond was the aircraft warning light. After leaving the warning light I descended quickly down a rough path. There were some breaks in the trees and I could see North Hornell below me. The trail continued to descend quickly and it was all I could do to brace my tired legs. Finally I came out on the paved road next to the filter plant. I walked down the paved road and a short distance later I saw the Econo Lodge ahead, and my car sitting below me. It was just a little before 7 pm. I had made it back with plenty of daylight to spare (mile 19.1 – 6:49 pm).